How bad are things for troubled retailer Sears? Let me count the ways. Sears (SHLD) stock has plunged more than 35% this year. There are worries that Sears could file for bankruptcy in 2017 or 2018. Chapter 11 rumors have plagued Sears for some time now. But the talk has resurfaced after ratings agency Fitch named Sears as one of several retailers that could soon default on its debt in a report last week. Another credit ratings agency, Moody's, said in a report last month that it was particularly concerned about "the viability of the Kmart franchise." Sears and Kmart merged in 2004 and the home of the Bluelight Special has mostly struggled ever since. There is even speculation that Sears may look to pull the plug on the Kmart franchise. Cue the "Rain Man" jokes. But Sears CEO Eddie Lampert has had it with all the negative chatter. Lampert sought to reassure investors and customers on Monday in a post on the Sears corporate blog. Lampert wrote that the frequent reports about Kmart's demise are "false and exaggerated." He added that "there are no plans and there have never been any plans to close the Kmart format." But he conceded that some unprofitable Kmart stores will be closed. Still, Lampert faces an uphill battle in convincing Wall Street and Main Street that Sears can be saved. 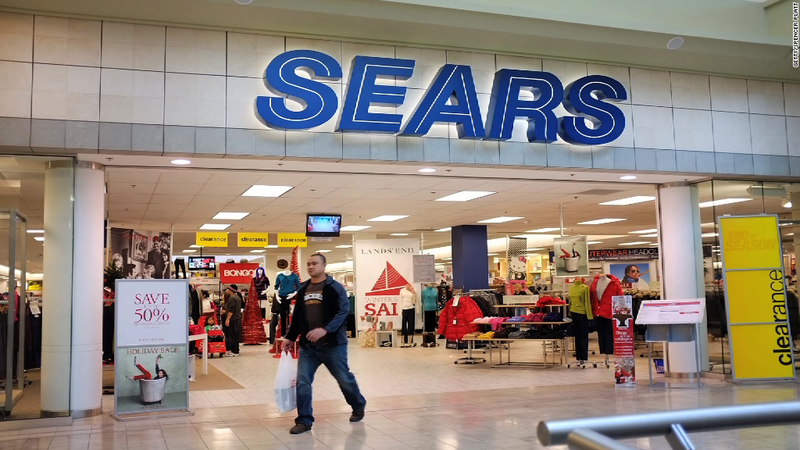 The company is predicting more red ink and analysts expect sales to keep declining at both the Sears and Kmart stores for the foreseeable future. Sears said in May that it might even sell three of its most well-known brands -- Kenmore, Craftsman and DieHard. The company said it was looking at strategic alternatives for its Home Services installation and repair businesses as well. And Sears may be moving closer to a sale of some of these divisions. Shares of Sears surged 16% (tongue twister!) Tuesday after Bloomberg reported that Stanley Black & Decker (SWH) was among the bidders for Craftsman. Sears was once an icon of American retail. It was in the Dow Jones Industrial Average and lent its name to the famous tower in Chicago. But Sears was removed from the Dow in 1999 and that big building in the Windy City is now known as the Willis Tower. The company is a shell of its former self. It has been closing Sears and Kmart stores as sales dwindle. Sears spun off its Lands' End (LE) clothing business in 2014 -- although being free from Sears hasn't helped it. Lands' End shares are down 35% this year and not far from an all-time low. Sears has also spun off its Canadian operations and created a separate public company for some of its real estate assets -- Seritage Growth Properties. Sears Canada (SRSC) has plunged nearly 35% this year but Seritage (SRG) is up about 25%. Interestingly, the famous value investor Warren Buffett personally owns a piece of Seritage. Buffett's Berkshire Hathaway (BRKB) does not own a stake. Why is Buffett intrigued? Many on Wall Street believe that the ultimate end game for Lampert is to sell off its real estate properties. There could still be value there. Lampert cryptically teased the possibility of more real estate transactions in the blog post, writing that Sears had "an opportunity to create value" in the real estate assets "by monetizing them in a variety of ways." But can financial engineering really save Sears and Kmart at a time when Amazon (AMZN) rules the retail roost and Walmart (WMT) is staging a comeback? Related: Why is Warren Buffett is betting on a Sears spinoff? Lampert ended his letter by saying that "the retail environment generally has been challenging." He's right. Macy's (M), Kohl's (KSS), Target (TGT) and many other retailers have had a rough go lately too. But they're still profitable at least. Sears may be a lost cause, and Lampert could be running out of time to convince investors and consumers otherwise. But give Lampert some credit. He's kept the company afloat a lot longer than many had thought. I wrote a story about Sears bankruptcy rumors with the headline of "Tears for Sears" (I'm a child of the 80s. Sue me.) back in January -- of 2012.